Do you feel the same way? 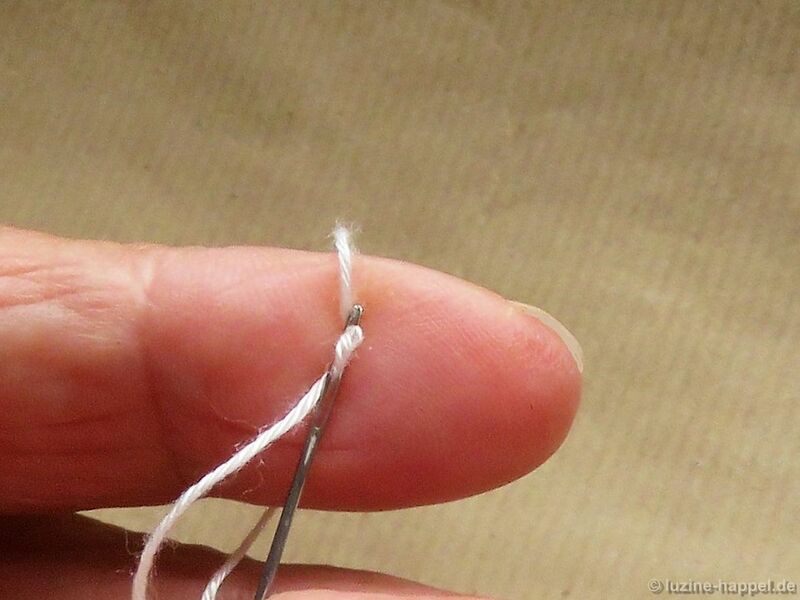 As we get older it gets more and more difficult to do simple tasks like threading a needle. One does not always have access to a needle threader, so here´s a clever way to thread a needle without using a special tool. Place the thread loosely over the index finger of the left hand. 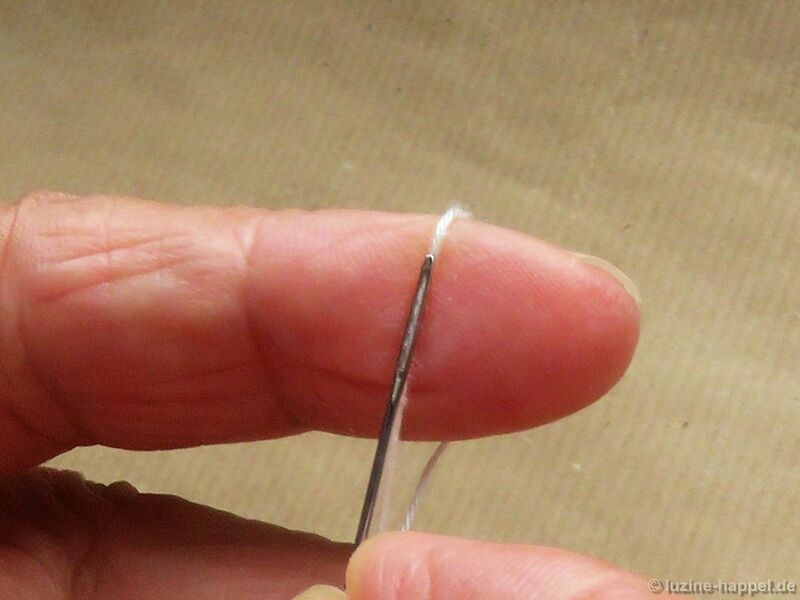 Place the eye of the needle upon the thread and press it lightly against the finger. 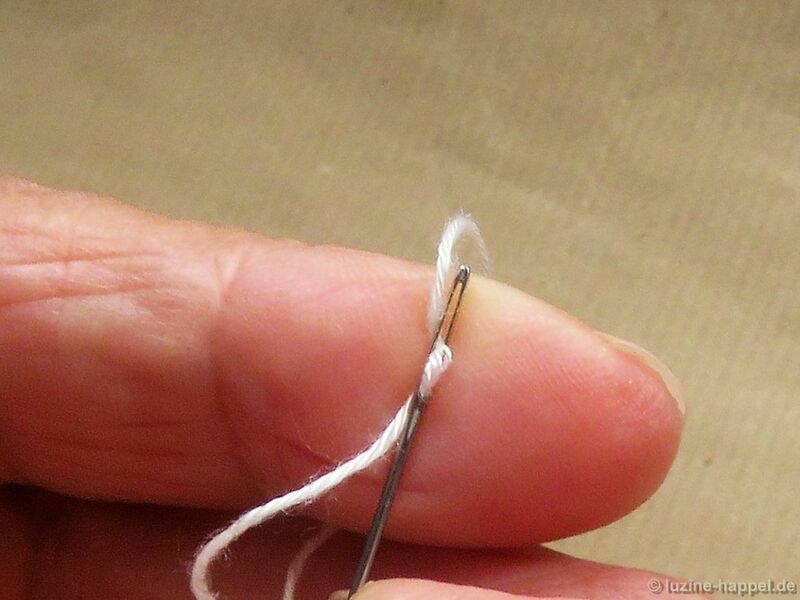 Hold the needle in this position, and move the finger back and forth in the direction of the thread. The thread rises through the eye after only the first movements. to pull the thread through the eye. 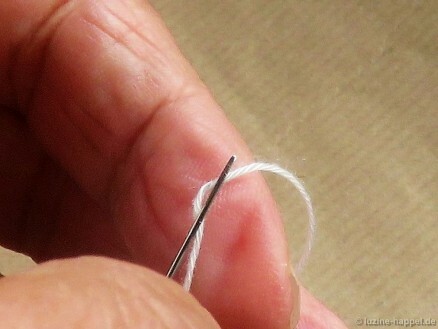 In order to understand the technique, you should practice with a large-eye needle and a thin thread. It took some practice for me to achieve success, but now it works well, even with fine needles and heavier threads. Brenda shared this tip with me during the last workshop, as she watched me struggling to thread a needle without a tool. Just I realized, that Susan Greening Davis was the one who taught Brenda and also all her students the needlethreadin after the last 30 years. I hope, you are not angry with me because of sharing. Dat is handig. Hartelijk dank! Just I added a note to the article, telling the trick was your´s. 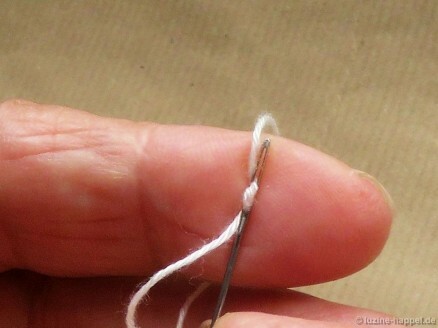 I have been threading my needles like this for years. Every time someone sees me do it they are astounded and make me show them how. Now I can send them here so once they have left they can refer to this. Thanks. This is superb! Thank you so much for sharing such a great tip that will help many people, including myself. Have a fantastic creative day! I followed a link from Mary Corbett’s Needle n Thread. Thank you very much. I will ret this method as I am finding it harder to thread a needle the older I am becoming. WOW, I am amazed that I am still learning something new everyday! Thanks so much To Mary Corbet for letting us know. So I hate to say this, but “necessity is the Mother of invention”! Thank you – this is so ingenious! Followed Mary Corbet’s link to your site. I was a cross stitcher 50 years ago and that was how I was told to thread needle. I don’t remember who. Can’t wait to try this! 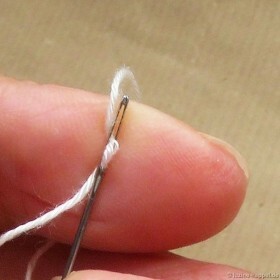 Threading a needle is really a chore now days! Thanks for sharing! And thanks to Mary Corbet for sending us your way! I was taught a similar technique for needlepoint. Fold the thread in half over the eye of the needle, pull the needle out and pinch the thread tight and poke through the needle. 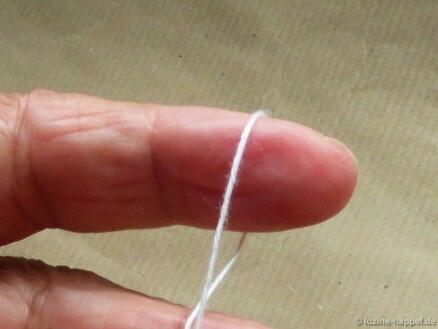 My grandmother used to use a small piece of folded paper with the thread inside and threaded it through the eye. Both work very well. KATHYANN APPLEBY …….I don’t understand how your grandmother did a needle threading with the paper, can you possibly show us??????? Wonderful idea. I will practice this as threading is getting hard for me. My mother used to tie a knot so it ended at the very end of the thread. Do you know this technique. Thank you. I’m happy with whichever method I decide to use. All technics are worthy of knowing. the lady in the shop said, finding it hard to thread of course at 72, so would you she gave me a new needle with a self threader on the end. Must take a picture and send it to you. Yes, that would be fine, thank you!